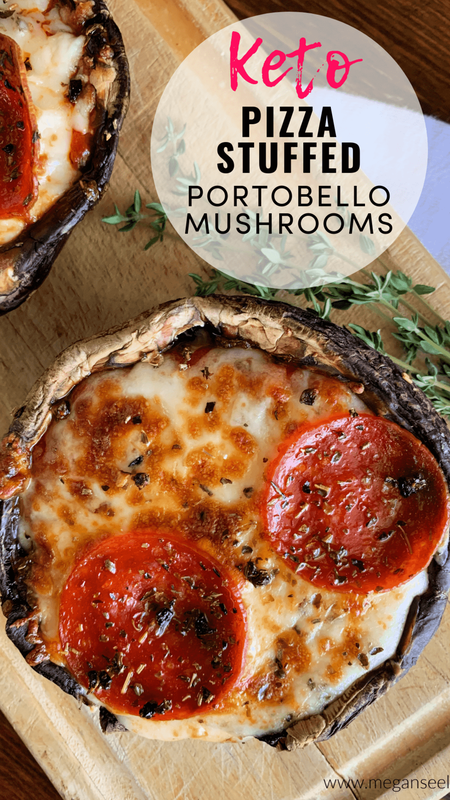 This Keto pizza recipe is made by stuffing portobello mushrooms with Keto friendly pizza sauce, Mozzarella cheese and your favorite pizza toppings for the perfect low carb personal pizzas. There is plenty of crustless pizza, fathead pizza recipes and cauliflower pizza crust recipes out there, but some times it can be A LOT of work, so I wanted to find another easy option. These pepperoni pizza stuffed mushrooms are tasty, filling and easy to make. Before prepping the portobello mushrooms go ahead and preheat the oven to broil and lightly grease a baking sheet, so it’s ready to go. Now, you’ll need to remove the stems from mushrooms before stuffing them. Then in a small bowl, combine the olive oil, garlic and four teaspoons of the Italian seasoning. Brush mixture evenly on the bottoms of each mushroom and place oiled side down onto the baking sheet. Fill each mushroom cap with two tablespoons of the Rao’s Homemade Pizza Sauce, 1/4 cup of shredded mozzarella cheese, and divide the pepperonis evenly among all the pizza mushrooms. Broil for about 8 minutes or until the cheese is melted and golden brown and sprinkle with remaining Italian seasoning and salt and pepper to taste. What Keto Pizza Sauce is Best? I recommend Rao’s Homemade Pizza Sauce (2g Net Carbs per 1/4 cup) because it is a sugar-free, naturally sweetened sauce, unlike most pizza sauces which, will have added sugar. Rao’s Homemade Pizza Sauce Ingredients: Italian whole peeled tomatoes, Italian cherry tomatoes, olive oil, carrots, onions, salt, dried oregano, garlic, basil. If you can’t find Rao’s at a local grocery store, you can find it here on Amazon. I was previously recommending a different pizza sauce, but recently updated this post after finding Rao’s as it is a much better option! The recipe makes pepperoni pizza stuffed mushrooms, but you can add whatever toppings you’d like. 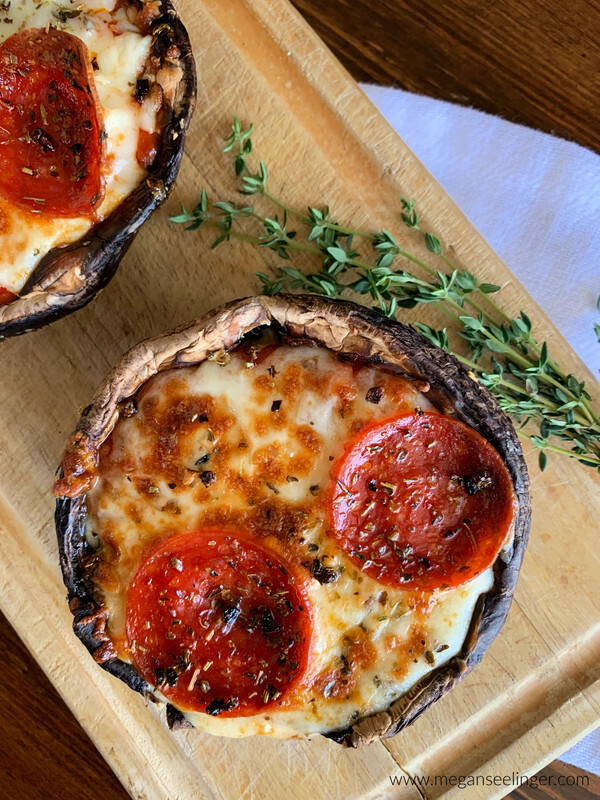 These pizza stuffed mushrooms are intended to be served as personal pizzas, so I typically eat a pizza or two, but you could go all out and have a pizza night that you can feel a little less guilty about! Since these are crustless pizzas that obviously eliminates a lot of carbs. 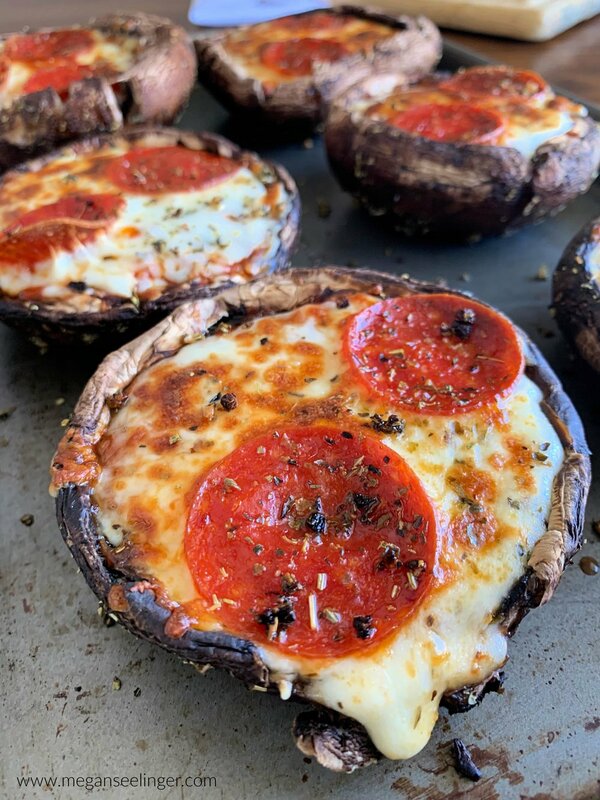 Each Keto Pizza Stuffed Portobello Mushroom is 193 Calories, 15.4g Fat, 4.3g Net Carbs and 9.3g Protein.